Welcome to the vegetable farmer on horse! At our place you will find environmentally friendly products and services with a focus on nature. We live in Björksta, located just about 15 km outside Västerås (direction Stockholm). 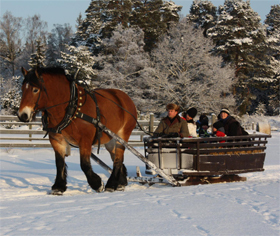 Here you will find different activities supported by our calm Ardennes horses.